The world was truly blessed when James Victor Scott was born in Cleveland, Ohio on July 17th, 1925. After 81 years, Jimmy is still performing around the world to thousands of fans. Married New Years Eve 2003 to Jean McCarthy, the two of them set off on a European tour, with stops in London, Istanbul, Paris, Austria, Monaco, Milano. Jimmy Scott has a metallic vocal timbre which is as disquieting and unmistakeable as Billie Holiday's; and a slender body which reminds that of a teenager, indelible memory of a rare hormonal disorder – the Kellmann syndrome – which was never properly taken care of in his youth. 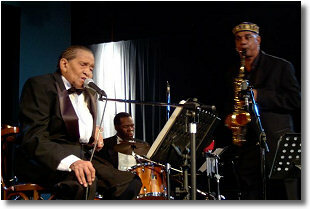 Jimmy Scott has been a cult artist, almost a Myth during the years in which he could work in the way which mostly suited him – that is – all around the States in the immense ballrooms and in the legendary concert halls with Lionel Hampton in the fourties and with Ray Charles in the sixties. Then Jimmy Scott suddenly disappeared from view, and would probably have most unfortunately remained in this situation if a few years ago Lou Reed at first and then David Byrne and David Lynch hadn't rediscovered him. His last album, "Holding Back The Years", includes some of the most beautiful rock evergreens of all times: "Jealous Guy" by John Lennon, "Slave to Love" by Brian Ferry, "Holding Back The Yars" by Mick Hucknall and "Nothing Compares 2U" by Prince. Ray Charles describes Jimmy's singing, "This man is all about feeling. He defined what 'soul' is all about in singing long before anyone was using that word!" Friend and fellow musician Lou Reed about Jimmy: "I first met Jimmy Scott through the remarkable songwriter Doc Pomus. I'd heard about him for many years. At the gathering after Doc's passing Jimmy sang. He has the voice of an angel and can break your heart. He did that day and many others.I've heard and even sung with Jimmy many times since then. Here is the singer's singer if labels mean any thing. Listening to Jimmy is like having a performing heart. The experience of life and the art of expression sing through Jimmy and make us partners in his incredible passion. I love him and I never want to say goodbye. When the song stops with Jimmy's last note we're back in the world as it was. Not quite so pretty, not quite so passionate. And we can only wait for Jimmy to sing again and take us that little bit higher." The late Blues Singer and Songwriter Doc Pomus, Jimmy's dear friend and champion: "Jimmy Scott can touch you in your deepest parts and even find spots that you never know you had. He sings the slow notes slower than anyone else and he has a way of bending notes that is uncanny. It's like he is trying to find out how much he can control and try a note without messing up his perfect pitch. He sings behind the beat further than anyone else ever could and every time I'm certain that he finally gets too far back, he returns somehow. His meter is always impeccable. He has a wide vibrato and the combination of his timing, pitch, and soft sweet sound gives every song a dream-like, love fantasy quality. No one ever sings or sounds like him." The Jazz Expressions, are the high-octane bop quartet that's toured worldwide backing legendary singer, Little Jimmy Scott. With Jimmy's blessing, these musical road warriors are charting new terrain with their recent release, On the Road, an impressive collections of original compositions that range from swing, to Latin even funk. 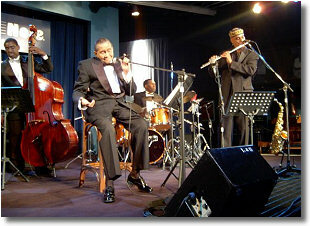 Lineup of the band: Aaron Graves (piano), Dwayne Broadnax (drums), Talib Kibwe (sax and flute), Hillard Greene (double bass). 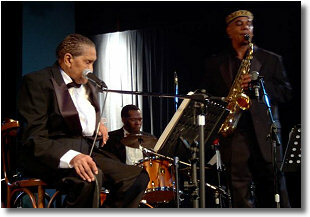 The Jazz Expressions have been the back-up band for Jimmy Scott for fifteen years with Hilliard (Hill) Greene as Musical Director since 1994. The Jazz Expressions, Jimmy Scott's back up band are on stage and they are opening the concert with a bewitching instrumental piece from their album "On The Road". Mr. Talib Kibwe's mellow voice on sax is truly captivating and Mr. Aaron Graves gives us a tasteful proof of his brilliant piano playing. The whole band is very well balanced and a great pleasure to listen to. Dwayne Broadnax at the drums and Hilliard Greene at the bass give a perfect rhythmical pulse to the band, and the interplay between all of them is fluent and flawless. Jimmy Scott is then introduced to the audience by Mr. T.K. Blue, and leaves his wheel chair to climb onto stage, helped by his wife and by Mr. Aaron Graves. We can perceive the whole band's attitude in Mr. Scott's regards is filled with thoughtfulness and great respect. 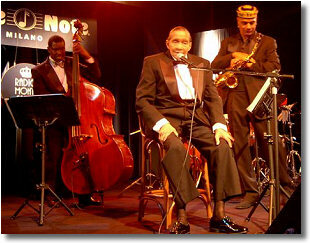 Jimmy Scott, elegant in his movements and in his smile starts his evening with his first song. His unique voice reaches down to the very depths of our soul because he's so intense. His phrasing is very personal, and unmistakeable. Mr Scott is offering his experience and his music very generously. "All The Way", "Embraceable You" (G. Gershwin) and "Pennies From Heaven" are among the songs Mr. Scott interpreted for us during the first set. The Jazz Expressions played "A Single Tear of Remembrance" (T.K.Blue), a piece which highlights the mellowness and warmness of Mr. T.K. Blue's melodious playing on flute. The piece is a poem in music, and all the instrumentalists sound great. At the end of the set, Jimmy Scott is surrounded by fans who wish to have the chance to have his autograph on one of his albums or on slits of paper. 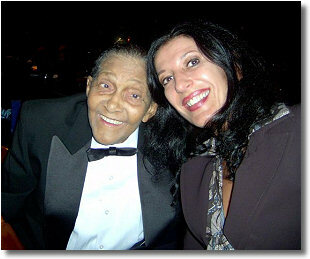 Jimmy Scott smiles and welcomes everybody with gentleness and kindness. I feel very lucky I had the opportunity of meeting Mr. Jimmy Scott and to see him on stage; he is one of my heroes, and I always loved his singing. To shake hands with him has been a true honour for me. 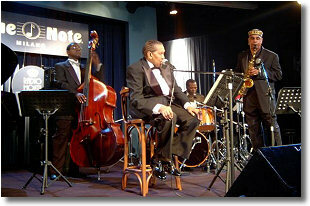 Many thanks to Jimmy Scott for blessing us with his unique voice and unique soul once again!